For music enthusiasts! 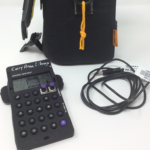 We now have a mini sequencing synthesizer available for checkout to CAPL cardholders for one-week loan. The PO-20 Arcade delivers 16 nostalgic arcade sounds, is a powerful chord engine and allows 128-pattern chaining for sophisticated, fast results. Included in the kit are an audio cord, a silicon case, and instruction sheets. One renewal is available if no holds are pending. This is a new item in our Library of Things collection.